We appreciate that your time is valuable and would like to accommodate your specific needs in making sure your purchase is processed as quickly and smoothly as possible. If you have only one cellphone to recharge, or you need airtime right now, we suggest that you follow the Single Recharge process. If we may, we would like to invite you to try this method as a first purchase – even if for a small amount, just to get a "feel" for our service! Airtime is loaded pin-less onto your SIM. Next time you want to recharge, simply make a payment with the correct reference. If you choose to do this basic recharge, we will gladly assist you once your first transaction has been completed successfully and you are ready to add more devices and products to your profile. Would you like to recharge the whole family's cellphones with a single payment - across all providers? You can recharge up to 50 cellphones with a single payment in your own secure PP24Profile. Payment via EFT is quite simple. All you have to do is set Prepaid24 up as a beneficiary using our banking details, and then make a payment using the unique reference number that is generated after you have followed the transacting process. The SmartFund is a popular option with clients, as it allows for instant product delivery. It is a universal payment facility for all your prepaid product purchases and is unique to Prepaid24. 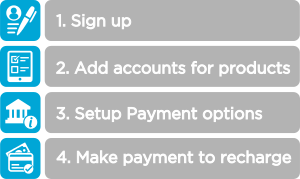 This feature allows you to have funds ready for your product purchases, without having to log into your online banking. Top-up your SmartFund via EFT or by means of a Credit Card payment. The Credit Card payment facility is available for SmartFund top-ups ONLY. Your Credit Card details will be saved in your own secure MyPP24Profile ready to top up your SmartFund when required.